she likes it when i keep the blinds open. i like it too. Very cool. 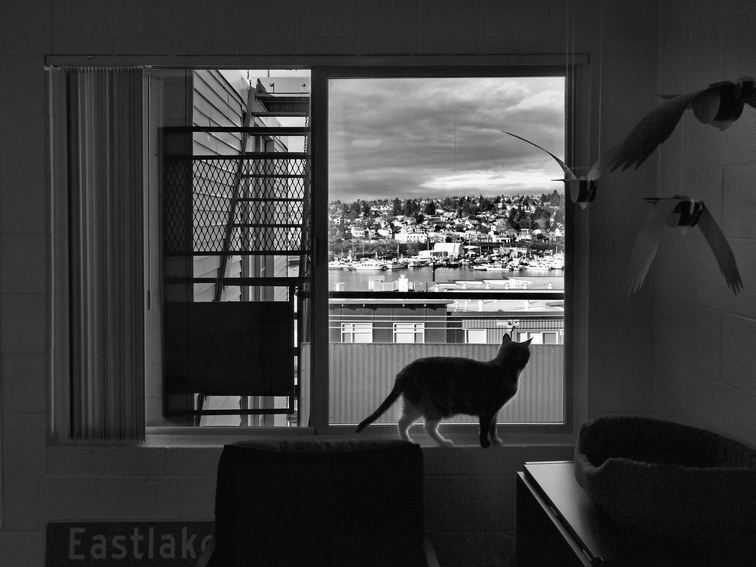 Great view through the window (cat seems to agree). thanks david. i agree too. i guess the apartments to the north of ours have a better view, since they don't see the metal stairs, but i like that stairway since the crows often perch on it. the cat likes that they perch on it too. she imagines she is hunting them. she isn't. Wide view for small cat. Like this much. Lovely photo. And what a great view you have. Great view for me too! Love that the exposure let's me see both the inside and the outside. @paulobrabo - initially the inside was pretty dark. i had to push it a lot in post processing. The photo has been viewed 2455 times.